This Digital Window Display is Counter Balanced in Reverse Configuration so the Base does Not Protrude. This is Ideal for Retailers with Storefront Space to Merchandise. This Digital Window Display is the Perfect Form of Electronic Merchandising. 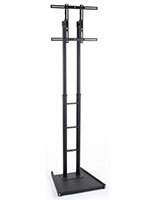 Extra tall, height-adjustable post has ten preset levels, ranging from 48-1/4" to 84" from floor to center of tv bracket. Weighted base to counterweigh tv so it is flush with the interior storefront glass. 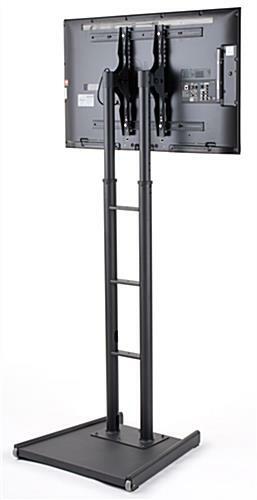 Holds most 32"-65" flat screens weighing less than 175 lbs in landscape or portrait orientation. In-post cable management to hide unsightly wires. 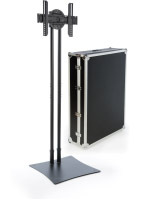 This extra tall digital window display stand, also known as a storefront plasma mount, allows the screen to sit flush with the glass making it easy for passerby customers to see. 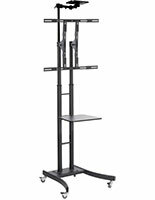 This display is equipped with a mounting bracket which holds most 32" to 65" flat screens weighing less that 175 lbs in portrait or landscape. This plasma mount post, digital window display stand that has a black finish blends nicely into any storefront. This freestanding cart has a heavily weighted base that faces the rear of the posts to provide a store-front solution. 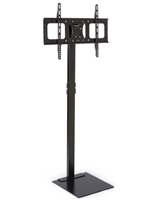 Retailers who utilize this digital window display stand can use the base to place mannequins for in-store merchandising. This flat screen store fixture is an affordable and innovative method for retail stores to promote through electronic signage. This digital window display stand is adjustable to suit many different spaces and ensure that passerby customers get the best view. This freestanding display does not require store owners to screw anything into the floor, ceiling, or walls! This digital window display that is for use in a store-front is an innovative solution for retailers who do not want to mount a tv from the ceiling! This flat screen mounting post includes a cutting edge design to ensure that the flat screen is right up against the storefront glass. 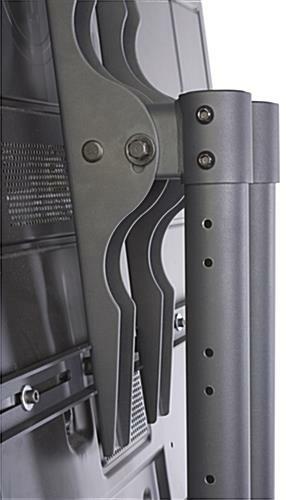 This flat screen digital window display stand has 10 set height adjustments to accommodate nearly any sized storefront. This cart has two wheels so users can move by tilting and rolling as needed. 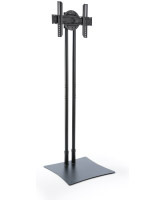 This digital window display stand is designed with a back platform for placing decorative or merchandising displays that customers can see from the inside of an establishment. 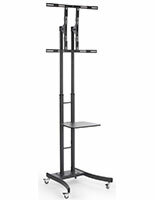 This digital window display stand is VESA compatible and includes a mounting hardware kit that will accommodate most flat screens.